So What Is The Agile Boost Camp Workshop? “This format is amazing. All workshops should run this way”. 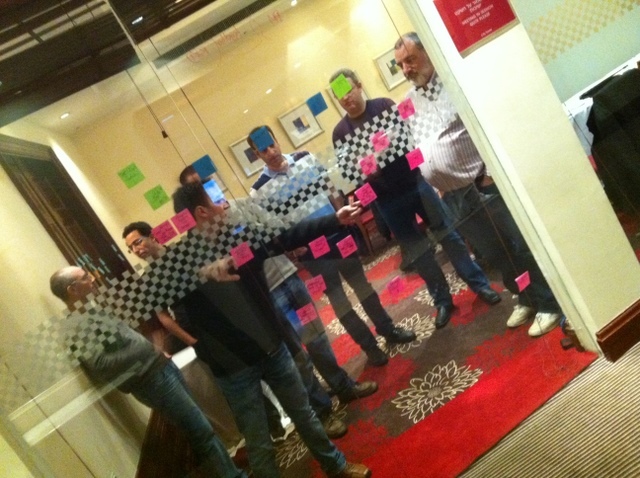 This entry was posted in Agile, Events and tagged agile, agile boost camp, Agilesparks, kanban, noestimates, pomodoro, scrum, scrum-fall, team estimation game, Workshop on April 16, 2015 by Yuval Yeret. One of the topics we wanted to explore was the responsibilities/activities of Product Owners and the Agile Team and how do they relate. The objective of the exercise was to understand the various activities and how they map in the continuum between PO and Team and across the product development life cycle. Map all the activities related to the life cycle – typically this will be the lifecycle of a Feature. I came with a set of predefined steps but I think it can be useful to let the participants come up with the activities as a digesting activity. Which activity is associated with Product, Which with R&D? Use vertical team estimation game to drive a consensus among the team. The meaning of vertical is that you don’t touch the left-right placement, just the top-bottom. Top should be solely Product, Bottom solely R&D. Identify a middle area where work is done in collaboration. Even within that area it makes sense to discuss who is “leading” the activity. Debrief – Have a discussion about what this means, what are the surprises, does this make sense, what you would like to experiment with. This exercise can of course be generalized to any interface between groups – Dev-Ops, Dev-Test, and outside of Product Development altogether… I’ll be glad to hear about interesting uses of the exercise. View more presentations from Yuval Yeret. This entry was posted in Games, Product Ownership and tagged agile, Gamestorming, Product Ownership, RACI, Workshop on January 31, 2012 by Yuval Yeret. So far we’ve been getting rave reviews for the workshop. It seems to be getting across the essence of what Kanban means for the product development/maintenance world. The experience includes playing the kanban game, doing exercises and thinking about your own environment, as well as discussing the theory, connecting Kanban to the Agile world, and looking at some case studies from the AgileSparks portfolio in Israel. I’ll be delivering this workshop, and I think it is going to be the 8th Kanban workshop I’m delivering in the last couple of months. So if you heard about Kanban and am interested to see what it really is about – come check it out. I’d love to see you there. This entry was posted in kanban and tagged Agilesparks, kanban, Workshop on January 25, 2011 by Yuval Yeret. The feedback was great overall, and there is a lot of interest in creating a community to keep taking this forward. In the meantime see some pictures from the event over at agilesparks, thanks to Gil from Agilesparks for the photography! This entry was posted in kanban and tagged Agilesparks, Israel, kanban, Training, Workshop, קנבן on July 26, 2010 by Yuval Yeret.